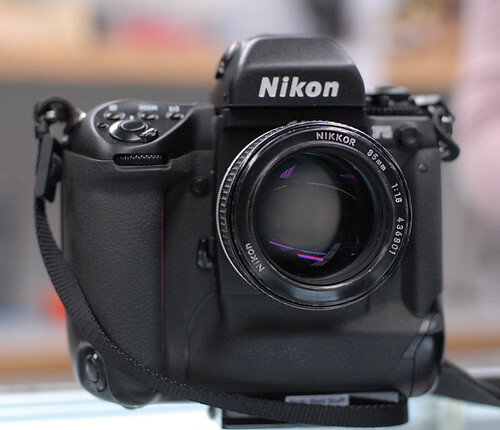 The Nikon F5 is a autofocus 35mm film SLR camera manufactured by Nikon in 1996. It was the fifth model in Nikon's flagship film camera line. 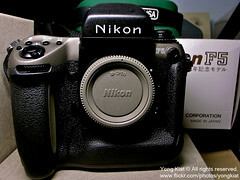 It replaced the Nikon F4. The Nikon F6 replaced the F5 in 2004. The body of the camera is very large, as it has a integrated motordrive with vertical grip. It is capable of capturing at up to 8fps. It uses an electronically controlled vertical focal plane shutter with speeds of 30 to 1/8000 of a sec. Flash sync is at 1/300 of a sec. US patent 4664485 -- viewfinder? This page was last edited on 27 November 2016, at 17:37.